After watching The Anna Edit's anti makeup haul on YouTube the other day I thought I'd do my very own anti haul and share with you five things I won't be purchasing anytime soon. If there was ever a bigger gimmick this has to be it. In case you haven't seen it it is basically two eyeshadows that go together one of them is for the lid and the other is for the crease. You're meant to rub the dome blender into both of the eyeshadows at the same time then sweep across your eye to create an easy smoky eye. First things first, what even is that blender?! Nobody has the same eye shape or size so I don't know how this is meant to work. I've watched countless videos and I haven't seen it work yet for one person, they end up with a crazy rainbow across the eye! I'd much rather save my pennies and buy two nice eyeshadows. For some reason there has been hype revolving around unicorns all of a sudden and a few brands jumped on the bandwagon and released a unicorn highlighter; this is basically just a rainbow stripped highlighter. Other than fancy dress I don't see why or how anyone would wear this, this product is clearly just for the Insta's and then to collect dust in the darkest depths of the beauty drawers. I do secretly still want one and I feel like I'm the only one who still hasn't, but my goodness I can not bring myself to pay for delivery then shipping charges, by the time that's all added up I could have brought a car. Plus everywhere does them now so I don't need them in my life (bit of reassurance to make myself feel better inside). I love ABH, I love Nicole Guerriero and I also love highlighters and think this palette is to die for but I don't need so many highlighters and I think I'd just buy it to look at it lovingly. If they sold each one separately (and in the UK) I would be all over them like a rash. Sorry Benefit, I do love you really but just not these two products! Again, this looks like another gimmick that I'm not going to jump on board with. I just really don't see the point in it and none of the colours really stand out to me anyway. 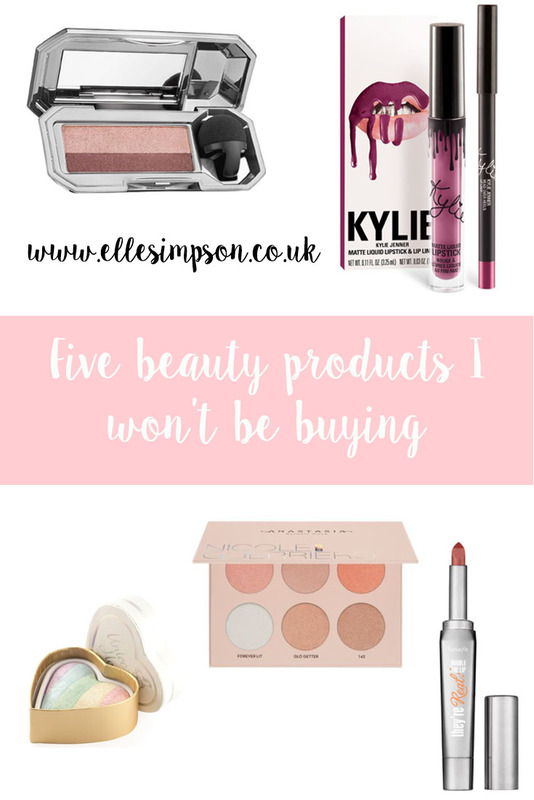 So there you go, five beauty products I won't be reaching into my pocket for! What products will you not be buying?